Ukraine's parliament has approved an executive order signed by President Petro Poroshenko imposing martial law in parts of the country, in response to Russia's seizure of three Ukrainian naval vessels and their crew members off the coast of Russia-annexed Crimea the previous day. Poroshenko also said intelligence data suggested there is an extremely serious threat of a land-based operation against Ukraine by Russia. "I have a document of intelligence in my hands. … Here on several pages is a detailed description of all the forces of the enemy located at a distance of literally several dozens of kilometers from our border. Ready at any moment for an immediate invasion of Ukraine," he said. Martial law would "in the event of an invasion allow us to respond quickly, to mobilize all resources as quickly as possible," he said. What does martial law do? The new measure is being imposed in areas of the country bordering Russia, Moldova and along the Black Sea and Sea of Azov coasts. According to the text of Poroshenko's martial law decree published online, it would allow authorities to restrict the rights and freedoms of citizens provided for by Articles 30-34, 38, 39, 41-44 and 53 of Ukraine's constitution.As Mustafa Nayyem, a Ukrainian journalist who was elected to Ukraine's parliament as a member of Poroshenko's faction, noted in a Facebook post on Monday, these constitutional provisions guarantee, among other things, the inviolability of the home; the secrecy of correspondence, telephone conversations and other correspondence; freedom of movement; freedom of thought, speech and expression; freedom of assembly; and the right to strike. 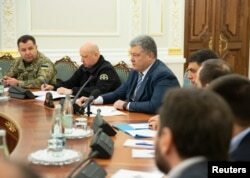 Poroshenko insisted Monday that the martial law decree does not include any measures restricting citizens' rights and freedoms or introducing censorship. "I hope politicians and the media will act responsibly and appropriately under the current circumstances and will not attack Ukraine with the theses borrowed from Russian propagandists," the Ukrainian president said. When the president first mentioned imposing martial law in response to Russia's naval aggression, some critics called it a "threat to democracy." Those included three former Ukrainian presidents, Leonid Kravchuk, Leonid Kuchma and Viktor Yushchenko, who declared in a joint letter made public Monday that imposing martial law would delay presidential elections expected early next year. Under the measure passed in parliament, martial law is scheduled to start November 28 and remain in effect for 30 days. Under that schedule, it's not expected to interfere with the start of the presidential election campaign season. Also Monday, Parliament approved Poroshenko's request for the presidential vote to take place March 31, 2019.